Jack Elam gets better and better year after year, Like fine wine, Jack ages well. If READERS DIGEST were to ask me to write an article titled ‘The Most Unforgettable Character Actor I Ever Knew’, Jack’s name would come to mind, pronto. Before I met him I’d get glimpses of this lanky, laconic lallygagger in flicks. When I finally met him, I felt I’d known him all my life. He was the brother I’d never had; my long-lost uncle, who once blew into town with gifts and wild tales; my dad, who died too soon. I liked Jack straight off, the way I liked his acting. Hutch’s Law! If I like your acting, I’ll like you—and vice versa. The abiding intelligence and humanity of the man overwhelmed me. Today I see a lot of sensational actors on screen showing off, but where’s the humanity? Jack Elam doesn’t show off. He doesn’t show you anything. He lets you discover it for yourself. Whether he plays the good bad guy or the bad good guy, he has the ability to take us along with him, so we seem to be working things out together. 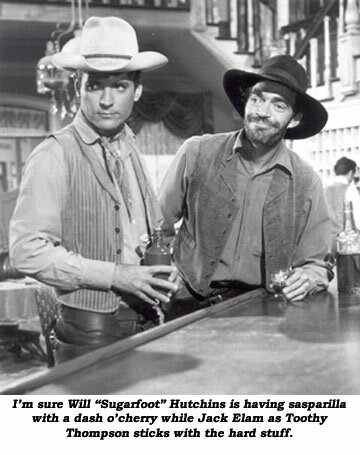 Laffin’ ‘n scratchin’, he ambled onto the “Sugarfoot” set toward trail’s end. We were mired in the muck of mellerdrama by then, and ol’ Jack perked up our spirits immeasurably with that diabolical grin and his fine-tuned senses of humor and comedy. Mellerdrama’s o.k., as long as you sprinkle it with comedy: Chaplin in the cabin teetering on the brink of a bottomless crevice; Harold Lloyd dangling from the arm of a clock high up the side of a skyscraper. We were dishing out soap opera, not horse opera. Jack added the needed salt to the stew. He played Toothy Thompson. He was so good that he was invited back to play Toothy in another episode. Never had more fun working with an actor. The script ran a mite short, so I suggested having Jack and me improvise. We could jes’ kick back on a bench on the board walk in front of the general store and jaw away à la Will Rogers as the camera rolled. ‘Nix,’ said the suits. They re-inserted some redundant humdrum claptrap, fraught with plot. Hi Ho. And so it goes. The leisure moments on the set were great sport with Jack at a convenient card table. With that great smile and those enlightened eyes that had seen and knew it all, he’d gently glean his winnings in sociable gatherings of Hi-Low Jack and the game. He doesn’t have a poker face—too much expresseion. No, that grin, that glint let you know that it’s adiós to your lunch money. One time Jack Elam invited me over to his vastly comfortable home on Laurel Canyon for a friendly game of poker. Oh! Oh! He knew he had a pigeon. Frantically, I rushed out and bought a book, THE EDUCATION OF A POKER PLAYER. Never had I boned-up for a test in college the way I crammed all those poker odds into my cabeza. At evening’s end I thought I detected a hint of frustration behind Jack’s farewell smile. I had WON! 75¢ to be exact. Best six bits I ever won. Yessir, the pigeon was flying the coop. Another time I told him I’d gone to New York to see Gwen Verdon in “Red Head”. She was sick that day; Allyn Ann McLerie was her replacement. Most of the audience walked out to get rain checks. Jack asked me if I’d walked out. Sheepishly, I admitted I had. Jack told me I had broken the actor’s code. I should have remained in my seat and cheered Allyn Ann McLerie on to victory, even if I’d been the only one to stay. Jack was like that, a great orchestrator, and a terrific actor, but, more important, a great representative of the Fraternal Order of Human Beings.